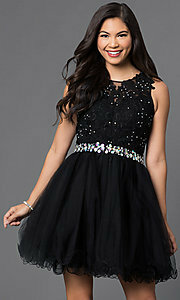 Step into this short homecoming dress that is fit for a princess. Whimsical details bring this pretty party dress to the top of the fashion-favorite list. The sleeveless scoop-neck bodice has sparkling-lace applique on sheer-illusion mesh with a sweetheart lining and a trendy back cut-out detail. Beautiful iridescent jewels sparkle around the natural waistline and are scattered delicately throughout the fitted bodice. The lined layered tulle skirt, ending in a curly rolled hem, flares generously from the jeweled waist of this short party dress. Under $100 and also offered in plus-sizes, this lace-bodice homecoming dress offers a fun and youthful style for hoco 2019, holiday parties and winter dances. The model in is 5' 9.5".